***OWNER WILL CONSIDER TRADE UP***This 82' Horizon Motor YachtIS A TEN!Starting forward on the main deck is the full beam aft deck with settee, large dining table, wet bar and port and starboard stairs to the swim platform. Entering CAROL ANN's main salon, one is greeted by the warm, inviting atmosphere created by a combination of piano-finished high-gloss cherry wood cabinetry with camphor burl inlays and trim. The use of rich textured fabrics, wall coverings and carpeting with indirect halogen lighting further enhance the ambiance of the room. Forward and two steps up from the salon is the country kitchen with gourmet galley, dining area and powder room/day head. Port and starboard aircraft style side entry doors are located between the galley and dinette. Immediately to starboard is a curved stairwell leading up to the flybridge/helm. Another stairwell forward, to starboard, leads down to the full beam master stateroom with his and hers baths, VIP guest stateroom and twin guest stateroom both with en-suite heads. The captain and crew staterooms/utility room is aft of the engine room, on the lower decks accessed from the interior via a stairwell on the port side aft in the main salon or through the swim platform door. 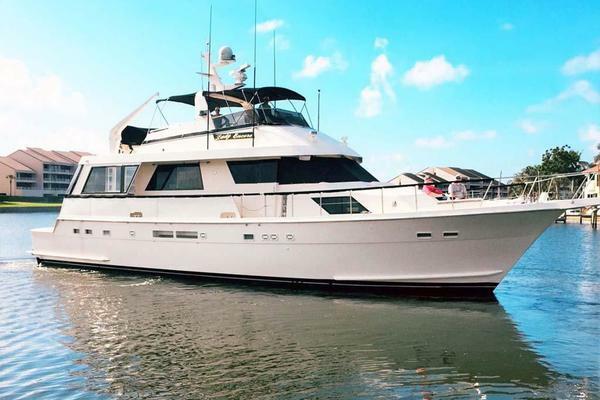 United Yacht Sales New Jersey would love to guide you through a personal showing of this 82' Horizon 2001. 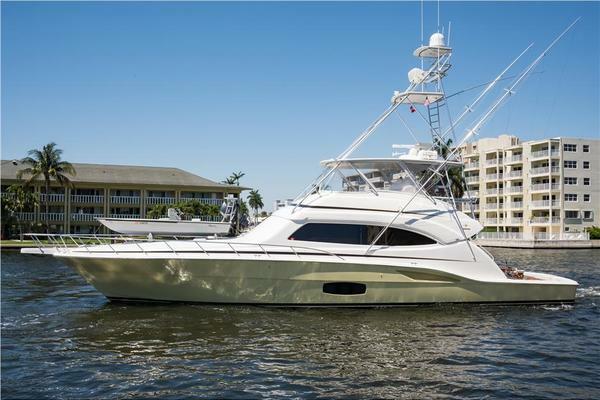 This yacht for sale is located in Fort Lauderdale, Florida and priced at $1,350,000. For a showing please contact us by filling out the form on this page and we will get back to you shortly! The spacious main salon is accessed directly from the aft deck through a stainless steel framed glass sliding door. To starboard is the recently reupholstered comfortable L-shaped settee, custom cherry wood cabinetry with a side table and wide custom wet bar that retracts when not in use. On the port side of the salon is an entertainment center that features a 42" plasma screen TV monitor(2015) and a remote controlled electric lift which disappears into the cabinetry. In addition, state of the art audio components offer six channel Dolby Digital home theater surround sound. Forward of the settee and entertainment center console are two upholstered chairs each with an ottoman and an additional table. A variety of lighting which allows different options to create many different moods, from subtle ambiance to day-bright reading light. Custom blinds and drapes behind cherry wood frames control privacy and light. Full beam master stateroom with a king size center-line berth with storage beneath. Built-in nightstands flank the bed on either side. On the starboard side is a built-in upholstered seat and additional dresser. The aft bulkhead of the stateroom is mirrored in sunburst pattern lending to the feeling of spaciousness. Masterful joiner work with curved cherry wood doors open to his and her closets. A 24" HD TV (2015) with a VCR and stereo system built in above the TV cabinet.On either side of the berth are entry doors to his and her baths. The baths are separated be an oversized Jacuzzi tub with shower. Travertine marble floors and counters, Jadco fixtures, Headhunter heads and high gloss cherry/camphor wood trim. Impressive VIP guest stateroom located forward. Features include a queen size center-line berth with storage below, 2 hanging lockers, HD TV with built-in VCR and an AM/FM stereo. The bulkhead is mirrored in a sunburst pattern similar to the master. Built-in night stands are on either side of the berth. The en-suite bath includes an oversize stall shower, Headhunter head, Jadco fixtures, and Travertine marble floors and counters. The guest stateroom has twin berths separated by a built-in night stand with storage drawers below. Possible options to slide 2 berths together to provide an additional double. A 10" flat screen HD TV is built in overhead. A bath with stall shower, Travertine marble floors and counters, Vacuflush head, and Grohe fixtures en-suite. Captain Quarters:Comfortable aft crew quarters with captain's cabin with double berth with custom innerspring mattress. Built-in night stand with drawers below, adjustable halogen reading light and hanging locker. A 13" HD TV is built into the overhead.Guest/Crew Quarters:Crew cabin with upper and lower berths. The upper berth is hinged and swings down to convert to a lounge. A 32" high built-in chest of drawers serves as a night stand and has a pull out desk top extension. A HD 13" TVis built into the overhead. The crew's cabin and captain’s cabin are both finished in high cherry & camphor with the same attention to details as is found throughout.Aft of the crew's cabin, on the port side, is the utility/storage room with abundant storage in cabinets that are built-in overhead and below. Sub Zero freezer and refrigerator, one double storage closet plus additional closet. To starboard, aft is a concealed 2 burner cook top and utility sink and built-in wine cooler. The floor and gangways aft are covered in marine blue Pirelli rubber tiles. It is, also, equipped with a stacked washer and dryer that was added in 2015. Forward of the salon to starboard is a stairway leading to the flybridge. This area is divided into three sections. The forward third is dedicated to the helm station with 2 new Stidd helm chairs (2015) and a stainless steel destroyer style wheel. The 3 new overhead hatches on the bridge above the helm station provide additional light and ventilation. The electronics array of gauges and controls are wall placed. Flush-mounted electronics are mounted on a new face panel with a drawing of CAROL ANN with location lights for equipment. Aft of the helm, to starboard, with a new built-in banquet with seating for 6. Across and aft of the helm to port is a built-in wet bar with refrigerator and icemaker. Just aft on the port side is a built-in love seat. The aft end of the flybridge to starboard is a built-in cabinet containing an ob-deck built-in freezer and work space. To port is a storage cabinet for glasses, etc. Further aft is a rebuilt 2015 1,500 lbs Nautical Structures davit. The entire flybridge is enclosed with EZ2CY and is air conditioned/heated with 24,000 BTU's. The flybridge, also, has an HD TV. Custom grill station with gas infra-red grill, freezer, 3 stainless steel drawers and stainless steel cabinet door. Most of the Garmin equipment was new in the fall of 2013 with updated screens installed in 2015.